Albert Snyder has always sworn that he wasn't doing it for the money. He wasn't waging a four-year legal battle against Westboro Baptist Church, the Topeka, Kans.-based fringe group that stages protests at military funerals, for a cash settlement. Yes, he was seeking millions in damages, but his goal was to silence the group. Westboro believes that God is punishing troops for America's tolerance of homosexuality and has called upon the church to spread this message. So in March 2006, seven Westboro protesters flew more than 1,000 miles to attend the funeral of Snyder's son, Lance Corporal Matthew Snyder, 20, who had been killed in Iraq that month. They hoisted revolting signs that said things like "Thank God for 9/11" and "You're Going to Hell" and "Thank God for Dead Soldiers." Snyder said he was fighting to protect other families already coping with the tragedy of losing a loved one from the pain that Westboro inflicted on him. Feeling that protesters ruined his son's funeral, held in a Roman Catholic church in Westminster, Md., Snyder got depressed. He could no longer drive his car for long stretches, alone with his thoughts, because Westboro's words were drilled into his mind. "To me, what they did was just as bad, if not worse, than if they had taken a gun and shot me," Snyder told TIME during a September interview. "At least the wound would have healed." But now, thanks to the Supreme Court, Snyder has lost more than the money he might have gotten in damages. He's lost the bigger fight. His attempt to shield Westboro's targets fell short. The group will only get louder. In a sweeping 8-1 victory for Westboro and First Amendment fundamentalists, the Supreme Court on March 2 upheld Westboro's right to picket a military funeral. The case, Snyder v. Phelps, was among the most charged on the Supreme Court docket last year, as Snyder sought to recover the $5 million in damages awarded to him by a lower court jury but overturned on appeal. The Supreme Court affirmed the judgment of the Fourth Circuit Court of Appeals: in this case, the First Amendment shields Westboro from torts of intentional infliction of emotional distress and intrusion upon seclusion. The decision shocked Snyder. "It's easy for eight Justices to sit up there and take away your privacy rights when they'll never have to worry about that," he says. "No one will get three, five or 1,000 feet away from the funeral of anybody in their family. So it has no effect on them. It has no effect on the politicians, no effect on the celebrities. It has an effect on us, the everyday people. And now Westboro can pretty much do and say and act however they want. And there's not a damn thing anybody can do." In his arguments, Snyder asked the judges to examine the context of Westboro's speech. The protesters said hateful things at a funeral for a young man who made the ultimate sacrifice: fighting for our country. Doesn't common sense dictate that we make a free-speech exception? Don't let the nuisance near a funeral, he argued. But to the court, content trumps context. "The fact that Westboro spoke in connection with a funeral ... cannot by itself trump the nature of Westboro's speech," Roberts wrote. "Westboro's signs, displayed on public land next to a public street, reflect the fact that the church finds much to condemn in modern society." Because of the nature of Westboro's protest, the court also rejected Snyder's "intrusion upon seclusion" claim. Snyder cited the "captive audience" doctrine in his arguments: since he had to attend his son's funeral, which couldn't be moved somewhere else at the last minute, he could not avoid the protest. In Frisby v. Schultz, for example, the Supreme Court upheld an ordinance prohibiting picketing "before or about" an individual's residence. Since you can't just pick up and move, you're a captive audience. In this instance, however, the court noted that Westboro "stayed well away from the memorial service"  some 1,000 feet. When driving to the funeral, Snyder saw only the tops of the signs; only later, on a television broadcast, did he see the sinister speech. The protesters gathered lawfully, on a public area under police supervision, and did not interfere with the procession or service. Snyder may have been secluded at the funeral, but the court insists that Westboro did not intrude. "We decline to expand the captive audience doctrine to the circumstances presented here," Roberts wrote. Snyder's lone backer, Justice Samuel Alito, wrote a passionate dissent that accuses his colleagues of being plain mean. "Respondents' outrageous conduct caused petitioner great injury, and the Court now compounds that injury by depriving petitioner of a judgment that acknowledges the wrong he suffered," Alito wrote. He seems to be asking them, How can you sleep at night? "In order to have a society in which public issues can be openly and vigorously debated, it is not necessary to allow the brutalization of innocent victims like petitioner," wrote Alito. "I therefore respectfully dissent." Perhaps another adverb is more fitting: angrily. Any reasonable person, Alito opined, could interpret Westboro's signs as personal attacks on a dead soldier rather than opinions about public issues. "God Hates Fags" could have been viewed as an attack on Matthew Snyder's sexuality. "Moreover," Alito wrote. "Since a church funeral is an event that naturally brings to mind thoughts about the afterlife, some of the respondents' signs  e.g., 'God Hates You,' 'Not Blessed Just Cursed' and 'You're Going to Hell'  would have likely been interpreted as referring to God's judgment of the deceased." Roberts emphasized that the court's ruling was narrow. Since, at the time of the protest, Maryland law did not dictate the minimum distance funeral protesters must stand from a service, the court declined to evaluate the constitutionality of the 44 state statutes that have passed picketing restrictions. And then there's the separate question of whether there are limits to free speech in cyberspace. About a month after his son's death, Albert Snyder came across a posting on Westboro's website that said he and his ex-wife "raised [Matthew] for the devil." After seeing this note, Snyder threw up, and then cried for three hours. The lower court considered how this message affected Snyder's emotional state. The Supreme Court, meanwhile, did not factor this post into its decision, in part because "internet postings may raise distinct issues in this context." Alito called this explanation "strange." Though the majority opinion mostly avoided language with broad free-speech implications, one section could set precedence  and it raises even more questions. 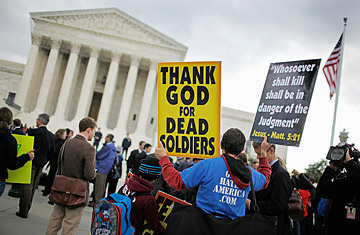 Roberts wrote, "And even if a few of the signs  such as 'You're Going to Hell' and 'God Hates You'  were viewed as containing messages related to Matthew Snyder or the Snyders specifically, that would not change the fact that the overall thrust and dominant theme of Westboro's demonstration spoke to broader public issues." So does that mean a protest group has license to carry one or two offensive signs that cause a person severe distress as long as most of their other signs pertain to some public issue? And how do you define "overall thrust and dominant theme"? Can 70% of the signs be benign and 30% offensive? Or is the split 80-20? How about 60-40? Further, why should such a split matter? If you or a family member were verbally assaulted while in a vulnerable state, why would there be any comfort that most of the other signs were not directed at you? Why would that soften the blow? This passage clearly troubled Alito. The Justice argued that even if you were to agree that most of Westboro's signs referred to issues of public import  and Alito stresses that he doesn't  "I fail to see why actionable speech should be immunized simply because it is interspersed with speech that is protected. The First Amendment allows recovery for defamatory statements that are interspersed with nondefamatory statements on matters of public concern, and there is no good reason why the respondents' attack on Matthew Snyder and his family should be treated fairly." Westboro members boast that the Supreme Court ruling will strengthen their cause. Margie Phelps, daughter of Westboro founder Fred Phelps and the lawyer who argued the church's case to the Supreme Court, vowed to "quadruple" funeral protesters. "It's so impressive and amazing," says Margie's sister, Shirley Phelps-Roper, "that it compels us to go quicker. This nation's destruction is imminent." We shouldn't be too fearful of these words: Westboro often talks a big game and then fails to show up at events. And according to Westboro, America's destruction has been imminent for at least 20 years. Snyder, meanwhile, says he's ready to move on. "It's over," he says. "I fought the fight." Pushing forward won't be easy, especially since the court's decision arrived the day before the fifth anniversary of Matthew's death. Snyder says he'll spend more time with friends and family  "That's been one thing I've neglected," he says  and try to find closure regarding his son. During these years of legal battles, Snyder never got to grieve. The legal loss will compound the sadness. "I'm just very disappointed in America today," Snyder says. "You've got countries that won't even let these people on their land [Britain banned Phelps from entering the U.K. for a protest], and we allow them to desecrate a Marine's funeral. There's something very wrong. "We have other countries laughing at us right now."